Should You Choose a Vessel Sink? During a bathroom remodel , you may want to choose new fixtures and features that will provide your space with fantastic style. Your bathroom remodeler can help you pick out exciting new features for your bathroom, such as a vessel sink. Unlike a conventional drop-in sink, which sits below the surface of your countertop, a vessel is a basin-like unit that appears to rest on top of your counter. To help you decide whether a vessel sink will be a functional part of your new bathroom design, here is a look at some signs that you should choose a vessel sink for your bathroom remodel. You are seeking exceptional style. One of the top benefits of a vessel sink is that this type of sink is sure to wow your family and guests. In fact, you can expect your new vessel sink to serve as a focal point for your bathroom design. If you want to provide your new bathroom with over the top styling that showcases your personal flair, a vessel sink may be a great choice for your renovation. You want to speed up the installation process. 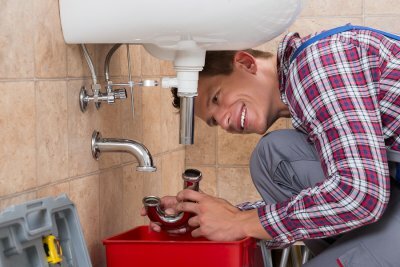 To install a new vessel sink, you will need to work with a professional plumber. A fantastic advantage of a new vessel sink is that this type of sink is much easier to install than a conventional unit. 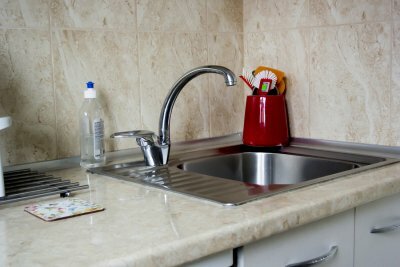 Rather than having to cut your countertop to fit the size and shape of your sink, your plumber will simply be able to rest the vessel on the counter’s surface. You would like additional counter space. Counter space can be at a premium, especially if you are sharing your bathroom with a spouse or other family members. Installing a vessel sink is a simple strategy for clearing up additional counter space in your bathroom. Rather than having to cut away at your countertop to make room for your sink, you will be able to simply rest your vessel on the counter’s surface. Modern design came into fashion in the post-WWII era and is characterized by clean lines, accent colors, and minimalist décor. 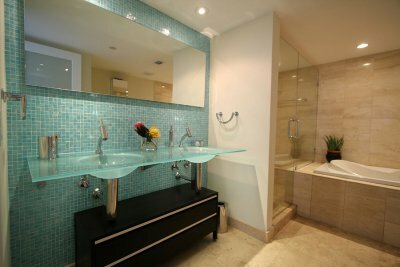 If you’re getting ready to contact a bathroom remodeler in Jacksonville , then consider the following design ideas to give your new bathroom an attractive and modern mid-century look. While cool, neutral colors may come to mind when you’re planning your modern bathroom remodel, some of the most impressive and memorable makeovers are created using bold, bright colors. These eye-catching accents can be incorporated in a variety of ways. For example, you could choose shower tile, a vanity countertop, or cupboards in colors like cobalt, scarlet, lemon, emerald, and marigold. If you want your bathroom remodel to remain free of bright colors and have a soothing, simplistic color palette, then another way to add interest to the space is to include modern patterns, like herringbone and chevron, using contrasting shades of gray, black, and white. These patterns can be incorporated by using wallpaper, floor and shower tile design, stenciled wall paintings, and vanity backsplashes. When choosing materials for your remodel, you’ll find that glass, slate, ceramic, stone, metal, and wood are some of the most common choices for modern bathroom design. However, it’s important to keep in mind that how you choose to display these materials can be critical for achieving a modern look. An excellent option is to combine materials like ceramic and glass into the room’s tilework. You could also combine wood and stainless steel into your vanity design. To pull your modern bathroom’s design together, it’s ideal to keep the shapes, curves, and angles of any furniture and accessories within a single aesthetic. For example, choosing storage, seating, and a toilet that have clean, straight lines, as well as lighting features with rounded, rectangular, or square shades and fixtures, can emphasize your bathroom’s modern design. Finally, remember not to pack too much detail into your remodel if you want to achieve the seamless and unadorned look for which modern design is known. While routine services from your plumber can be very beneficial for your house, you may be surprised to learn that your plumber can also help you protect the Earth and our environment. During your next plumbing repair appointment in Jacksonville, be sure to ask your plumber about bathroom design features that can make your home more eco-friendly. By replacing some of your major fixtures and appliances, you can conserve water and go green at home. Let’s review some ways that your plumber can help you save the Earth. Perhaps one of the most effective ways that you can save the planet through your plumbing is by replacing your old toilets. Toilets that are more than three decades old can waste significant amounts of water when they are flushed. In fact, your toilet may be using up to 7 gallons each time that you go to the bathroom. Replacing your old toilet with a new model can help you to save up to 5 gallons or more per flush. Hidden plumbing leaks can be major sources of water loss throughout your home. If you are concerned that your plumbing system is wasting water, you might want to hire your plumber to perform leak detection services. Using advanced technology, a plumber can trace leaks to their origins and repair them completely. Fixing your hidden plumbing leaks can help you to save dozens of gallons of wasted water every week. Another eco-smart service is low flow shower fixture installation. Today’s shower fixture manufactures have created low flow models that offer the same water pressure and overall feel, while saving gallons of water every minute that the shower is turned on. You are sure to be amazed at the great showering experience that a low flow fixture has to offer you. A professional plumber will be happy to provide you with additional details about how upgrading your plumbing can preserve the planet. With a kitchen remodel coming up, it is important to find smart additions and ideas that will create a successful project. Whether you are looking at a kitchen or bathroom design , extra storage and appliance upgrades are crucial. These additions will save you space and money in the long run, which will ensure your kitchen remodel near Jacksonville is a success. Continue reading for more smart ideas for your kitchen upgrade. Storage is one of the most important additions to a kitchen remodel, and it is often forgotten in favor of unneeded appliances and extra furniture. However, you will always be looking for areas to store pots, dishware, bakeware, and spices. With this in mind, it is smart to add storage wherever you can. Add more shelves and cabinets around your kitchen and dining space. Fill in an empty corner of your countertop with a built-in lazy Susan, and consider adding a kitchen island for more cabinet and countertop space. You can also hang pots and pans from the ceiling or on the kitchen walls to maximize your available space. Many kitchen appliances that are five years and older are not as energy efficient as appliances are today. When an appliance is not energy efficient, that means it is using more energy than required to perform a task. By upgrading your old appliances—such as a refrigerator, dishwasher, and oven—to newer versions, you can save money on your energy bills. Many newer appliances also offer various features that can save you money in other ways. For example, new refrigerators can maintain foods for longer, and new dishwashers can use less water. Lighting is an important feature in your kitchen. To allow in as much light as possible, consider updating your windows for more natural light. Talk with your kitchen remodeler about installing task lighting and ambient lighting too. These lighting additions can help you prepare your food, host parties, and eat dinner with your family. Constructing a new kitchen is an exciting project for any homeowner. 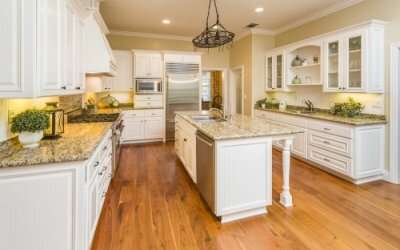 When you embark on a kitchen remodel near Jacksonville , you will be able to work with your kitchen remodeler to pick out the fixtures, appliances, and other features that fit best with your lifestyle. An important factor that you will need to consider during your kitchen remodel is the overall layout of your space. By considering the orientation of your kitchen or bathroom design, you can make sure that your room has the proper flow. 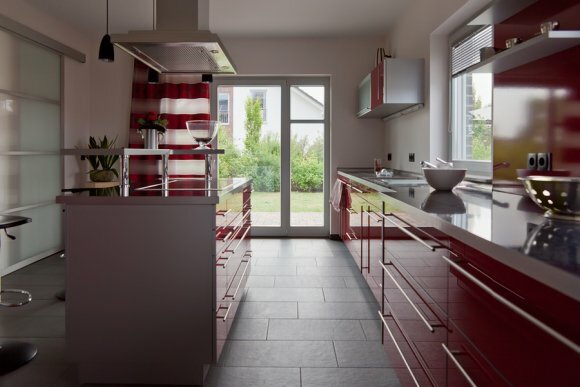 Let’s look at some tips to consider when you are laying out your new kitchen. When you are designing your new kitchen, you will want to gather inspiration and ideas from the different layouts that are popular today. Today’s kitchens feature many different layouts, including L-shaped designs, U-shaped formats, and completely open plans. By drawing your inspiration from other layouts that you see in design magazines or other resources, you can get a better idea of what type of layout will be suited to your family. A big factor that you will need to consider when you are laying out your kitchen is the size and shape of your kitchen space. 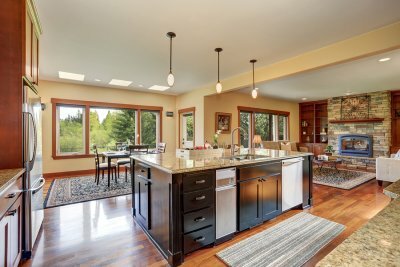 If you have a large kitchen that is directly connected to a living room or family room area, you may want to choose an open kitchen layout that is built around a central island. Smaller spaces may be better suited to single wall kitchen layouts. Your kitchen remodeling team can help you decide upon the ideal placement for the different fixtures and appliances in your new kitchen. If you will be installing a gas range, for example, you will want to place your new stove on a wall that is connected to your natural gas line. Other appliances, such as refrigerators and dishwashers, will need to be connected to your electrical or plumbing systems. When it comes time for a bathroom remodel near Jacksonville, you should take the opportunity to increase the efficiency of your household . You can work with your bathroom remodeler to choose a bathroom design that is practical, intuitive, and energy efficient. Many of today’s toilets operate much more efficiently than older models do, which can save you a substantial amount of money in the long term. Continue on to find out what you can do to make your bathroom more efficient. 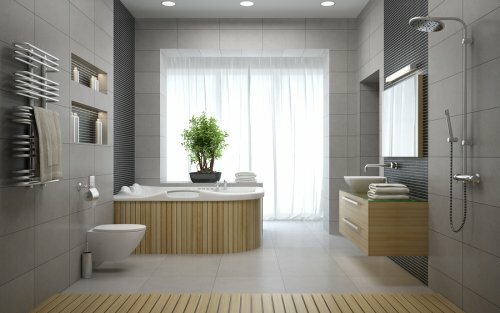 One of the best aspects of a bathroom remodel is the ability to make your bathroom more efficient. Homeowners spend a great deal of money on energy bills and utilities, but increasing your efficiency will reduce the amount you spend on monthly household expenses. Consider upgrading your appliances and fixtures to more energy efficient models. Your toilet, sink, and showerhead can all contribute to high energy bills, but energy efficient units will keep your expenses in check. If you are tired of constantly calling for toilet repair, talk to your plumber and choose a new toilet for your bathroom. Sinks and showerheads also come in more efficient models that can help you save water and, in turn, money.